Hello everyone! I’m a Japanese Language teacher in Hokkaido Japanese Language School. No matter if I am in Hokkaido or travelling overseas, I love strolling around to discover things that I have never seen, to find out shops I have never visited and to search for spots with marvellous views. So far I’ve been to Egypt, England, France, Germany, Swiss, Italy, Spain, USA (San Francisco and Hawaii) and Hong Kong. Egypt is my favourite place! Sweden, South Korea and Vietnam are my next targets!! The four seasons in Hokkaido are just fabulous! Beautiful flowers in spring, the lovely sunshine in summer, burning-like red leaves in autumn and snowing winter are all lovely. Also, Hokkaido is so big that you can never finish exploring it. In Sapporo, people here maintain a very good balance between urban spaces and nature. Also, the people here are friendly ^^ and food here is delicious. 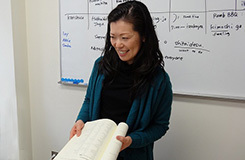 Hokkaido Japanese Language School not only teaches students Japanese but also provides various chances to students to experience the Japanese culture. Teachers and staff here are also nice so if you have any questions, please let us know. What I try to keep important in class is “study by enjoying!”. It’s about study, so it’s not always enjoyable. However, my goal is to help the class mates and make the class joyful. Also, not only do I try to make the lessons interesting, I make sure that everyone’s Japanese will improve when coming to JaLS. I will support you and I look forward in seeping you one day. Learn languages and eat delicious food! I attend French class once a week. Before I die, I want to be able to speak at least 5 languages. Also, I love eating delightful food, so I am constantly researching about restaurants and cafes in Sapporo. Philippines, Thailand, Guam, United Kingdom, and France. Now I want to travel more in Asia. The objective of JaLS is to “go back home with pleasant memories”. Even for new short term students, they will have an enhanced and safe time. I like socializing with people regardless of age or nationality. By interacting with people from all over the word, you can share many things together. From that, you can discover new things and surprises. In Hokkaido JaLS, it’s a place where you can learn Japanese well, and where you can interact with many people from around the world. 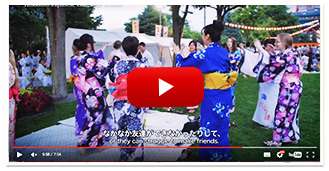 You can learn Japanese, interact with people from Hokkaido and all around the world. I look forward in seeing you! My hobby is to watching movies. Since I was very young, I have been watching many movies. I especially like action movies. If you can recommend me a movie, let me know. Actually, I have never been outside Japan… From now, I want to explore the world! Hokkaido is a very large prefecture in Japan. That’s why there are many attractions in each town. I think you will find charm and enjoyment where ever you go. Please try and travel to other towns, not only Sapporo. To improve my English level, I studied abroad in Canada. I have been studying grammar since very young, but I had hard time communicating and listening during my time. When I couldn’t understand the conversation, I asked the speaker to repeat what was mentioned, By repeating that, I remember that it improved by English little by little. I am currently studying with people that wants to study hard, and people that wants to speak Japanese. Sometimes, the students will teach me new things about their own country. I learn something new every day. Watching soccer and baseball in Sapporo dome is amazing and very entertaining. I also like listing to music and watching movie to refresh. I have been to Canada, United Sates, Finland, Spain, Italy, Thailand, Cambodia, and South Korea. I enjoy the city and all the nice food in all countries. Unlike Tokyo, the wind is pleasant. In Odori Park, you get to experience large festivals in each season. So you get to really enjoy the atmosphere. In spring, you get to see beautiful sakura. In summer, you can experience beer festival. In spring, you get to enjoy all the delicious food. In winter, you can enjoy the famous snow festival, etc. Odori Park is close to our school, so you can enjoy the festivals. =) The school is always thinking about the students. Even after class or during the weekends, there are activities for you to enjoy your time. You won’t waste a day in Japan. Like how you’re learning Japanese, I have been learning other languages too. It is very different from Japanese, so sometimes I felt that it was “hard and complicated” in learning a different language. But when I travelled in other countries and when I was able to communicate, it made me really happy. After experiencing how good it feels when you can communicate, it made me want to study more and more. For people that will be learning and for people that doesn’t have confidence in Japanese, I want them to have the same feeling as I did. I will support you to have this sense of accomplishment. Taking photos and touring around cafes. During my time off, I will take my camera and walk on the street or take photos of my dog at my house. I don’t drink that much alcohol but I love drinking coffee. So I go around looking for a nice café. If you find a nice café that serves nice coffee, please let me know. Australia, Sweden, the Philippines, United States, Korea and Indonesia. 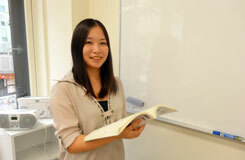 I was teaching Japanese in Australia, Sweden and Philippines. Hokkaido has many delicious food. What I recommend the most is cake, ice and milk that is used in sweets. It’s great! Since Hokkaido JaLS is in the heart of the city, after class, you can go sightseeing, eat delicious ramen and fully enjoy your time in Sapporo. Also, all the staffs are friendly and polite, so you can have a great time in Sapporo.